Perhaps the Republican leadership and its Establishment apparatus don’t realize just how dangerous is the game they’re playing against conservatives, or perhaps they just don’t care. There is a part of the GOP power structure that has always been most happy to serve as the permanent minority, personally enriched by serving as minor, ineffective obstacles to the ruling Left. They win elections by cadging millions from conservatives desperate to Do Something about the mess in Washington, then sink comfortably into that mess as though relaxing in a jacuzzi, rousing themselves only to display true fury against the occasional cage-rattling, boat-rocking conservative insurgent. There are always conservatives who denounce this state of affairs and pronounce themselves tired of serving as campaign-cash piggy banks for politicians who view them as far worse enemies than the Democrats, but in this election cycle, the “Let It Burn” caucus of disgusted, demoralized, and disengaged voters is particularly loud. I don’t think the Establishment understands just how bitter and dispirited their base has become. Republican leaders said they needed the Senate to get anything done, and they got it, in a historic midterm election landslide. They’ve done absolutely nothing with it. Harry Reid is still the effective Senate Majority Leader – in fact, he’s sitting prettier than ever, because he gets to watch Republicans use his grubby tactics to stymie conservative votes, while his hands remain clean. A Democrat will most likely get the official Majority Leader post back in 2016, and there won’t even be any sweat stains on the gavel when Mitch McConnell hands it back to him. Can anyone point to a significant event in the post-midterm Senate that would have gone much differently if Democrats were still the official majority party? We get no action on Planned Parenthood, even as the nation recoils in horror and disgust from their baby-organ-harvesting operation. We get no votes on anything of substance to conservatives, no votes that would force Democrats to spend political capital or take uncomfortable on-the-record positions that would alienate voters. The vote to block Obama’s hideous Iran sellout was pre-sabotaged by changing the rules so that Democrats can’t lose. All we get is the crony-capitalist Export-Import bank brought back from the grave, with Republican fingerprints all over the shovel. So when Cruz came to the floor looking for 16 senators to agree to hold a roll-call vote, only three raised their hands. McConnell, sitting at his desk, turned around and peered at Cruz, who looked stunned at what had just happened. The Senate dispensed with his effort by a voice vote and quickly moved on, doing the same to Sen. Mike Lee (R-Utah), a Cruz ally who sought to use arcane procedures to force a vote on defunding Planned Parenthood. How’s all that kindergarten respect for Democrats working out for you guys? Do these buffoons have any idea what they’re doing? Do they have a clue how badly their stupid schoolyard smackdowns play with their base voters? Wait until Senator Alexander is comfortably back in the minority, whining like a toddler about how good little boys and girls are supposed to respect each other, while the Democrats ruthlessly stamp his minority caucus into the dirt. A great deal of what Senator Cruz, and other upstarts like Senator Mike Lee of Utah, are trying to do involves turning the tactics of Democrats back against them. They want to fight with liberal ferocity for conservative causes. 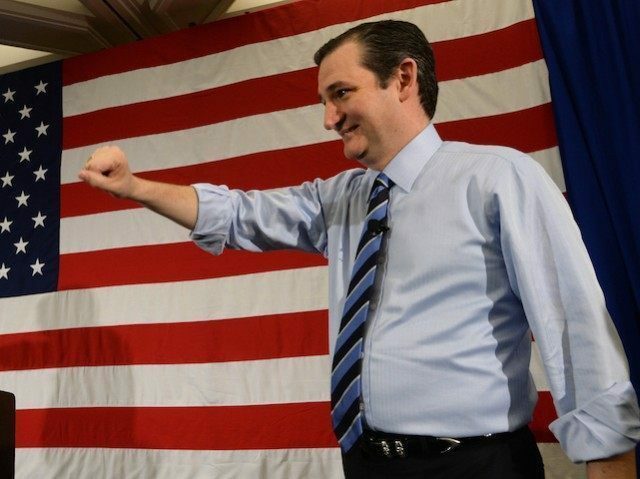 Ten minutes spent listening to Cruz makes it clear he understands exactly how the Left’s tactics work, and he’s ready to pull off the Republican gloves – which look like kid gloves, except they’re also connected by a short handcuff chain – and fight under the same rules of engagement. The only time the bloodless, weary, collegial, ineffective Republican leadership fights that way is when they’re beating down conservative upstarts. If only they would go after Democrats the way they just went after Ted Cruz! If you dessicated gentlemen of the GOP don’t relish watching Democrats seize total power in 2016 and returning to your comfortably padded back benches, you’d better learn how to do a bit of “grandstanding” yourselves. Ted Cruz didn’t start this war with the Republican establishment. Why aren’t their conservative-bashing tactics considered “divisive?” The U.S. Chamber of Commerce is openly discussing a big-bucks effort to not only freeze out conservative primary candidates in 2016, but actually take out sitting conservative Republican representatives. Isn’t that awfully “divisive?” Especially when one of the big reasons the Chamber is beating the war drums is their hunger for open borders illegal-alien amnesty – one of the most divisive policies ever inflicted on the American people against their manifest will, and an agenda which pretty much guarantees permanent Democrat political power. The current front-runner, Donald Trump, is defined by his very loud willingness to tackle Establishment forces, especially the media, which works to set the stage for every presidential election by telling Republican voters which acceptable, genteel losers they’re allowed to support. Trump critics argue that he’s staging an anti-Establishment burlesque, or maybe even running a false-flag operation ultimately intended to hand the election to Democrats… but there’s no doubt a large number of people are responding to what he’s saying, and interpreting the more arrogant responses as assaults upon their own character, not just Trump’s. Does anyone believe for a microsecond that Republican voters would rally behind the limp battle flags and tinny plastic trumpets of Mitch McConnell and Lamar Alexander to win the presidential battle of 2016? No, the Republican candidate, whoever it is, will spend a good deal of time apologizing to voters for what the GOP leadership has been doing, much as the Democrat candidates are trying to run against the Obama disaster without implicating him personally. Spoiler alert: it’s going to be a lot harder for the Republican candidate to dump their leadership baggage, partly due to the media, and partly because Republicans simply do not enjoy as many automatic votes as Democrats do. Segments of the Republican base have proven time and again that they will stay home, especially if they think voting is futile, or would involve supporting politicians who actively dislike them. While we argue about tone and tactics, and the Beltway media bemusedly wonders if Cruz or McConnell has the more accurate recollection of some lunch meeting, the actual record of the GOP leadership is a mountain of failure they simply cannot hide. Something has to change in Washington. Everyone knows it. The Republican establishment line used to be, “We can’t do anything when we’re the minority in both houses.” Then it became, “We can’t do anything with only the House.” Now they’re saying they can’t get a blessed thing done, or even start a political fight that would draw some Democrat blood, unless they’ve got the White House too. Meanwhile, parts of the Democrat base are angry about certain issues, they’ve got a bad case of Clinton fatigue already, and their leadership has been a disaster for America… but Democrat leaders don’t have to apologize to their voters for being an ineffective minority, because they’re not. They don’t back down from tough fights, or stroll across the media landscape bayonetting their own wounded after they lose one. From the very first hours after those stunning 2014 midterm results began rolling in, Democrats have acted as if the election was an insignificant, maybe even illegitimate temporary interruption of their power. President Obama openly derided the election as meaningless, while liberal pundits hammered out editorials musing that we shouldn’t waste time and money on midterm elections at all. The Republican leadership has given little indication that they disagree.